This large print is a unique statement piece of original art for dog lovers. It's a limited-edition linoprint hand-printed on Japanese Awagami Bunkoshi paper using traditional linseed oil sepia ink. The paper is creamy off-white in colour. 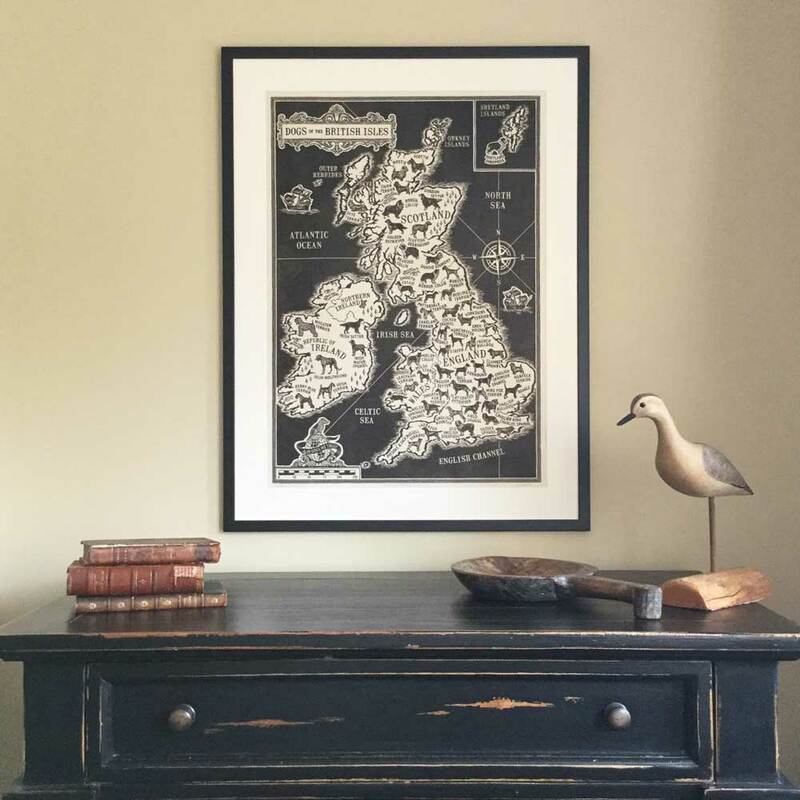 Edition of 60 prints, each one is individually hand-printed, signed and numbered. 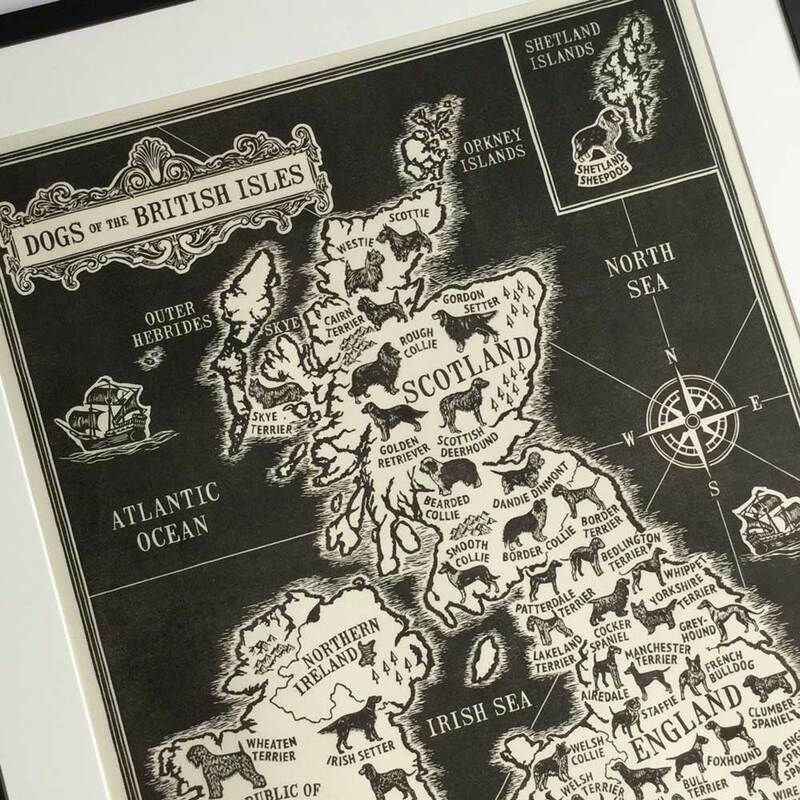 Inspired by antique maps of the 18th and 19th centuries, this print celebrates the many dog breeds that have originated in the British Isles. 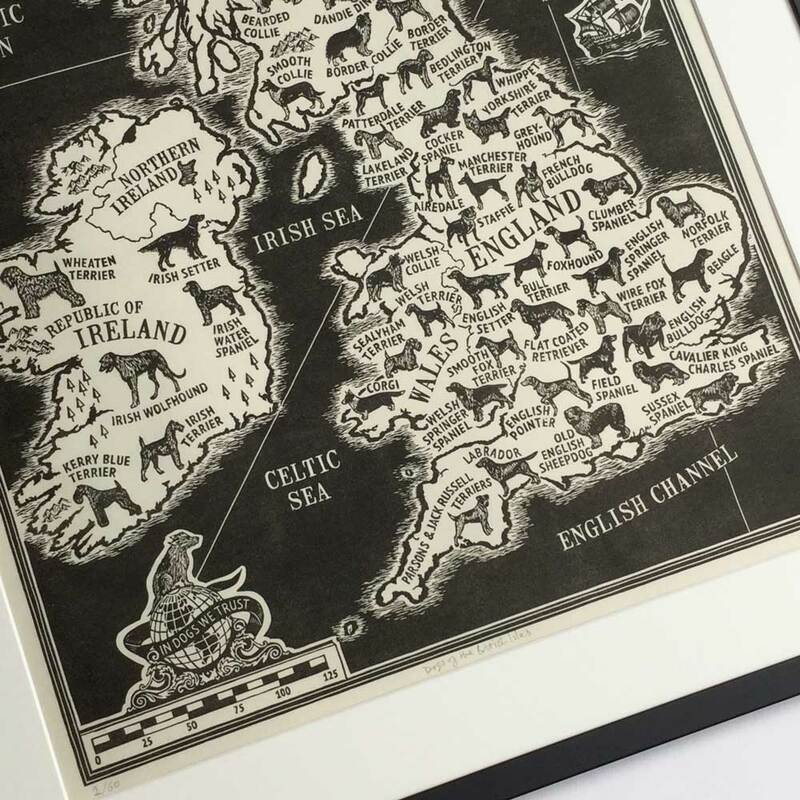 Also depicted are some breeds (like the greyhound) who despite earlier origins in other countries, were developed into the breed standard that we know today in the British Isles. 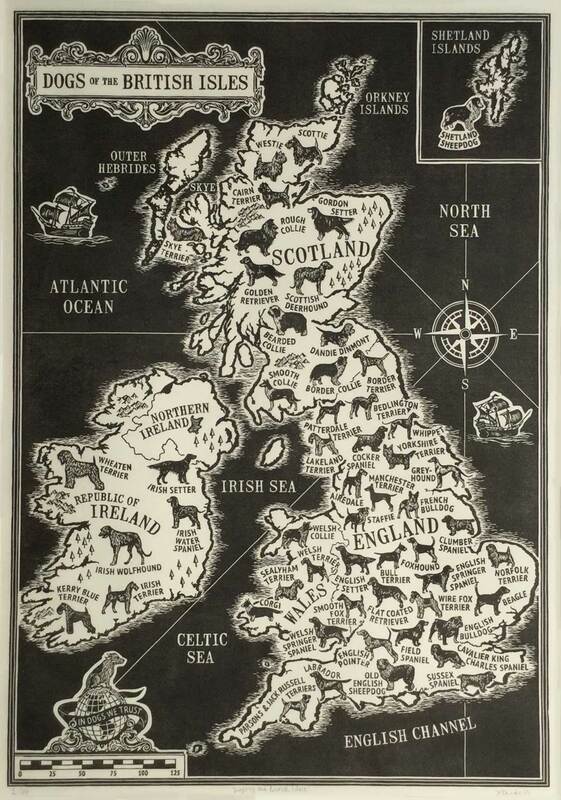 There was not space to include all breeds attributed to the British Isles so some difficult decisions had to be made in the development of the print, though many of the now vulnerable native breeds are included. If a breed can be traced to a particular area, it is illustrated in that approximate geographical location on the map (e.g. Norfolk Terrier in Norfolk), otherwise breeds are evenly distributed throughout the map. The British Isles is a geographical (not political) definition and includes England, Scotland, Wales and all of Ireland. 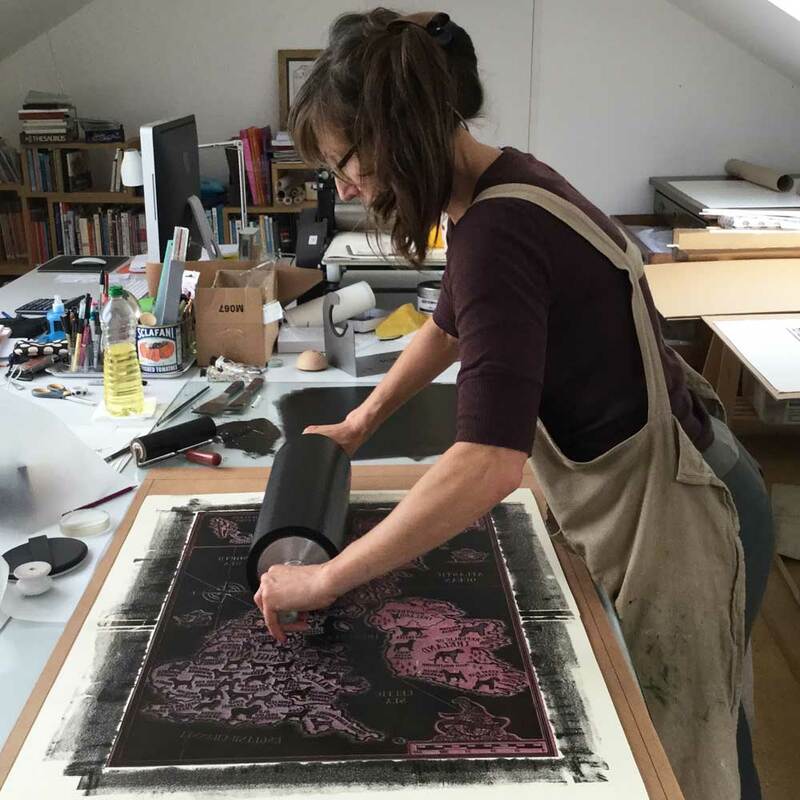 Each print in the edition is hand-printed from a lino plate. The design is carved by hand into the lino using a series of gouges. 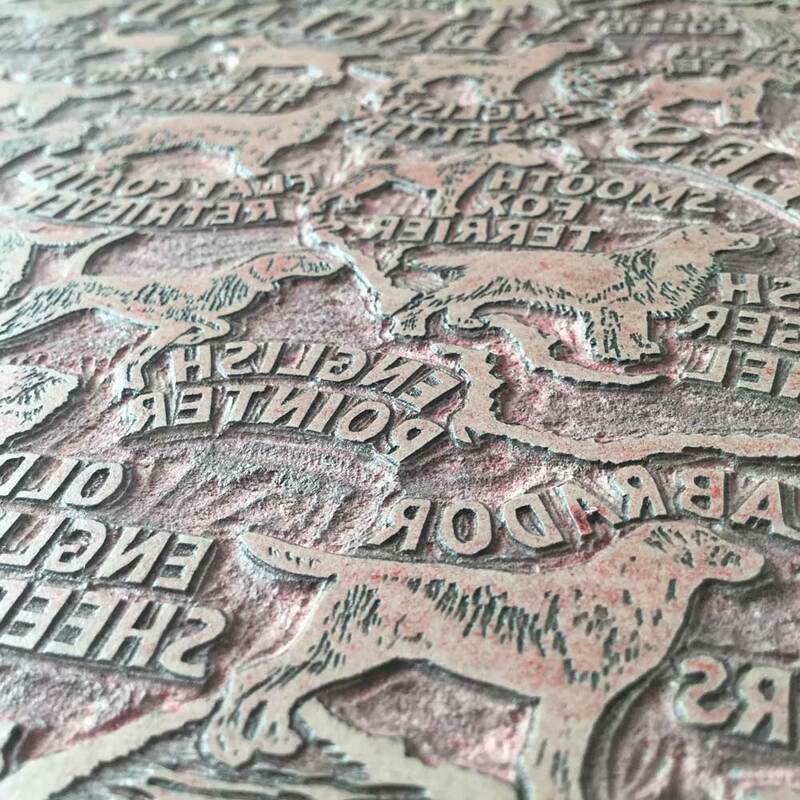 Each line and dog and all the lettering are painstakingly carved out (in reverse so that they are the right way round when printed) and as each cut is final — there is no room for error. It took over 60 hours of carving to create this plate. 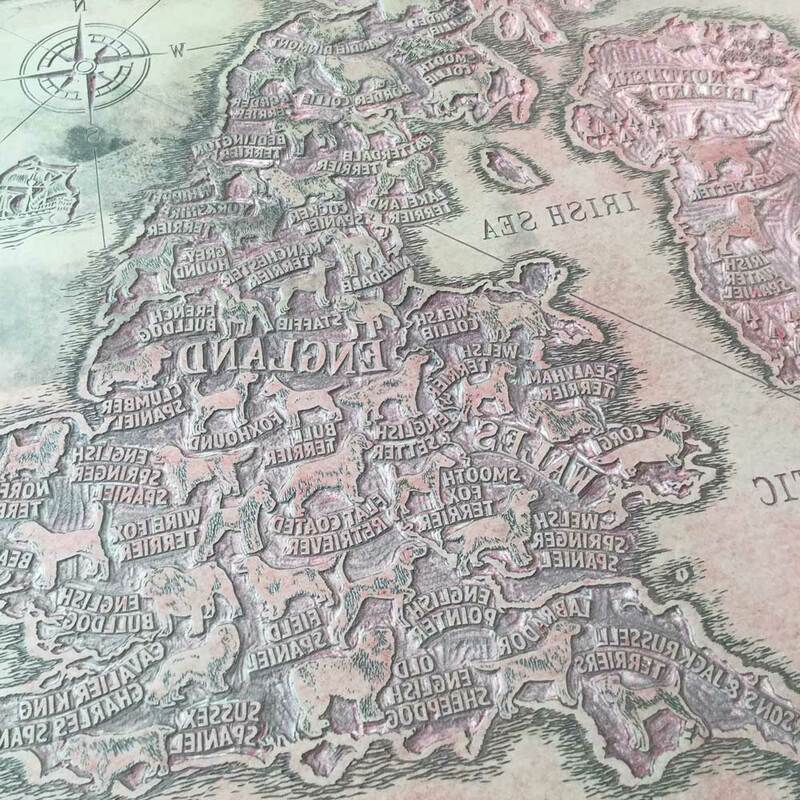 When the plate is ready to print, it is inked up with traditional linseed oil ink using a large roller (or brayer) and the Japanese paper is placed over the inked plate. The ink is transferred to the paper with the aid of special hand tools and an old etching press. Each print is then signed and numbered. Find out more about how this print was made on my blog, Inky Dog Press. The size of this print (paper size 60 x 80 cms) means that it is sold unframed. Shipping frames of this size is prohibitively expensive and carries a high risk of damage. Standard 60 x 80 cm frames are readily available online and in stores, however I would recommend getting a mount cut by a local framing shop or online supplier which, as well as setting off the print nicely, will keep the print away from the glass and prevent it from sticking. For a 60 x 80 cm frame, the external mount size is 60 x 80 cms with a recommended opening (aperture) of 48 x 68 cms.